I should probably preface this review by stating that I am not an audiophile. I would also like to say that the word audiophile has been hijacked by people who like using terms such as loss-less format, dynamic range, and Nyquist limit. When not using these terms, audiophiles spend the remainder of their day cursing at 13 year olds on World of Warcraft, while listening to Yes on vinyl in their mothers basement. When you append a word with phile, it means that there is a love for something. Thus, necrophilia is the love of corpses. (and by love, I don't mean true love) Turophilia is the love of cheese. Lame-ophilia means you enjoy watching the Bachelorette. Pornophilia describes 85% of American men. Do I love listening to music? Yes. So would you consider me an audiophile? No. If I want to stay in my WOW guild, they won't let me refer to myself as an audiophile. Reviews were mixed, but trended towards the positive. If there were an audiophile filter on the reviews, these buds would be close to 5 stars. As it stood, they sit just under 4 stars on Amazon. I will rate the ear buds in the categories I believe are most important. I have junior size ear-holes. I truly believe that when I'm in my 70's and ear hair has taken full root in my ear-holes, that the hair will create a web so thick, it will lead me to believe I'm hard of hearing. I'll purchase hearing aids when all I really need is a good pair of shears. I suppose it could be worse. I don't want such large openings so that birds attempt to nest inside. The point is that I need a "just-right" fit when buying ear buds. I can't do any of the hard-shell ear buds as they hurt after 5 minutes or so. 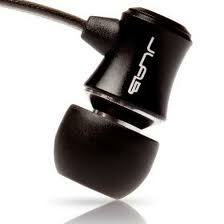 The J3's have 3 different sizes of squishy ear bud tips that fit just right and seal off noise from the outside. I prefer the medium size, and can wear them for multiple hours without any pain. Jlab actually provides a burn-in process on their website for their ear buds. They suggest multiple hours of this "noise" and then your buds will perform at peak performance. I quickly hooked up my ear buds to my computer, and streamed the noise. I can honestly say that there is a difference between the performance of the buds before and after the burn-in. What is it? I don't know, but my brain thinks they sound better now, and we're going with it. The bass is sufficient, the outside noise is minimal, and the higher frequencies sound nice. Quality sound. Listening to Paula Abdul's Straight up now tell me at medium volume levels with these buds really gets the heart a thumping. I am a religious ear-wax cleaner. Every morning I scrape my ears until they bleed as ear wax makes me cringe. That being said, every now and again, stray ear wax clumps can accumulate on the buds. Luckily, the soft tips are easy to remove and place in your mouth to clean. The buds come with a nifty hard case, different sizes of ear bud tips, and are shipped with "frustration-free" packaging. The case is a life-saver, and will greatly extend the life of the buds. The frustration-free packaging just means that you don't need a knife, screwdriver, and teeth of steel to get the package open. One knock I have is the length of the cord. When my mp3 player sits in my pocket, there is just barely enough cord to reach my ears. I would definitely have issues cranking some James Brown is Dead while playing Twister. Another minor complaint is the residual noise coming from the ear buds while running or exercising. If the cord bounces up and down and hits your arms/back, you'll hear this. Luckily, my large quantities of back hair seem to dampen this noise. The ear buds come in multiple colors including Paparazzi Pink and Electric Blue. On a separate note, Jlab has fired their marketing color scheme naming team. These ear buds are honestly a fantastic value, and sound pretty darn good. For the cost of a nice lunch at Good Wood, you can get quality ear buds that are backed by a 1-year warranty. I've put in hundreds of hours in the few months I've owned them, and their still going strong. A solid 4-star rating.